​The Magical Cardboard Unicorn is now available in a stunning and sturdy Baltic Birch Plywood! Our very classy Unicorn just got classier! A beautiful modern design makes our wood unicorn the perfect companion for home or office, and a creative gift for craftsy friends. In both wood and cardboard Merlin can be decorated with paint, glitter, wrapping paper, decorative tape, or other craft materials. See our How-To pages for details on customizing Merlin to suit your decor. 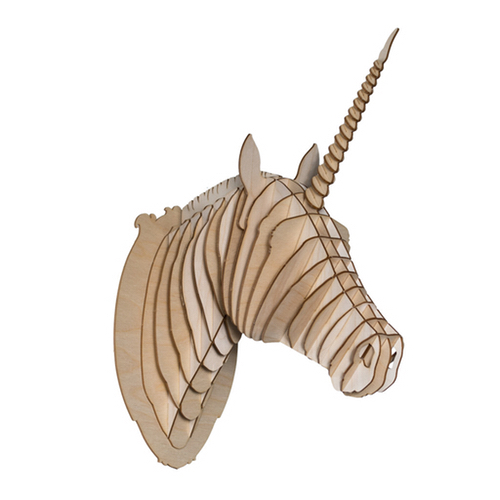 Each unicorn trophy is made of environmentally friendly CARB certified Baltic Birch plywood.